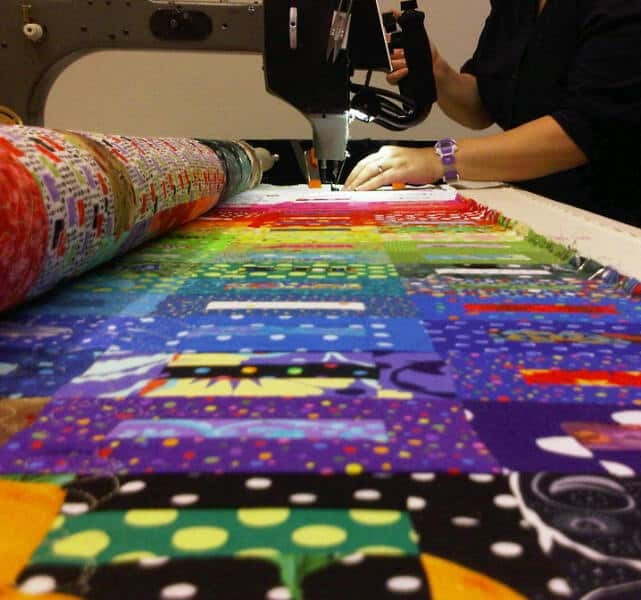 If you, mostly, do not quilt your quilts yourself, then part of your quiltmaking process should be preparing your quilt for your longarm professional. 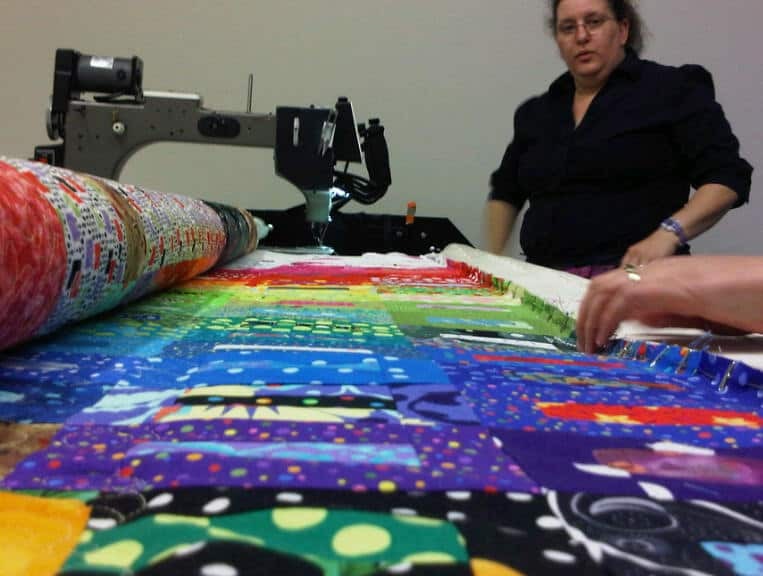 You can read my longarm rant which implies things to think about when choosing a longarm quilter, but regardless of who you choose, you will still have to prepare your quilt. To be honest, when I get to the “YAY! I have finished my top” stage, I am done with the quilt. However, I also don’t want a bunch of tops laying around, so I am working on finding the Zen or meditative qualities of finishing my quilts. For the top, don’t worry much about pattern or block design when thinking about the longarmer. I am more interested in what I want for the top. However, when I get to the back, I do try to be nice. 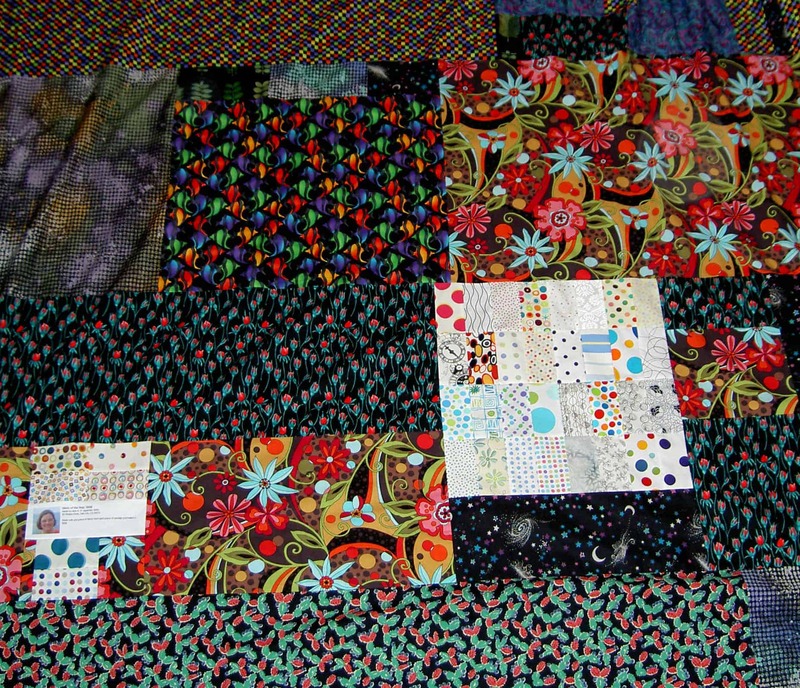 Part of the process or creating the Zen or meditative space in my head of finishing my quilts deals with the back. I no longer piece tiny squares together to create a coordinated back. I try to use very large pieces of fabric, which not only enables me to finish the back quickly, but also lessens the number of seams on the back for the longarmer. My personal, fabulous longarmer has never complained about seams, but I also don’t want her to become frustrated with me. I make pieced backs. That is just what I do. I see no good reason to buy additional fabric for the back when I have perfectly good fabric in my fabric closet that is not being used. Lately, I have started to try to remember to piece the seams open on the back. It doesn’t really matter in terms of construction, IMO, but it lessens the number of layers that the longarm needle has to punch through. My personal, fabulous longarmer has never said one way or the other, but I figure that it can’t hurt. If I know that the end of the seam will be on the outside of the quilt or NOT crossed by another seam I will also backstitch. I do this on the front also, so that the threads don’t pull apart as the quilt is being stretched on the longarm machine. Of course, I don’t always know, but I do my best. I try to make the back at least 8″ larger (4″ on each side and 4″ on top and bottom) all the way around than the size of the top. To do this, I lay the top on my design floor and build the back on top of it. I measure the top and the back and pin a post-it note to the quilt saying what the sizes are. I use hot pink post-it notes. 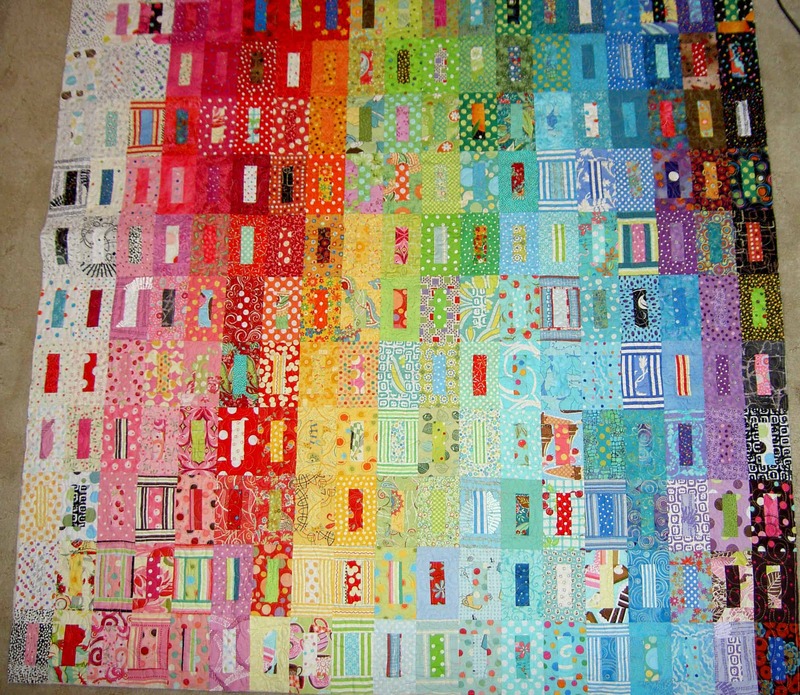 My quilts are generally square, but usually not perfectly square. They are often off by an 1/8″, but not much more. If I put the post-it note on, the longarmer clearly knows what s/he is dealing with and can’t blame me later for lousy piecing (Well, s/he can, but I can just look at him or her sarcastically and not feel bad). I take them out as I piece. There is no later. If my personal, fabulous longarmer runs over a pin I left on the quilt, I pay to have her machine repaired. My fault, my problem. I embellish with anything 3D AFTER the quilting is done. If there is some reason that I put a button or beads in a section of the quilt, then I pin a very bright post-it note to that area. I also point it out to her when I bring the quilt to her. If my personal, fabulous longarmer runs over an embellishment on the quilt, because I didn’t warn her, I pay to have her machine repaired. My fault, my problem. As much as I despise pressing the top and the back I do it just before I take the quilt to the longarmer. Then I hang the top and the back on a pants hanger. The pants hangers have to be tough and have really strong clips, because those quilts are heavy. If I don’t press the wrinkles will not ‘quilt’ out. This is the last step. Once the quilt is on the hanger, it is ready to be taken to the longarmer. 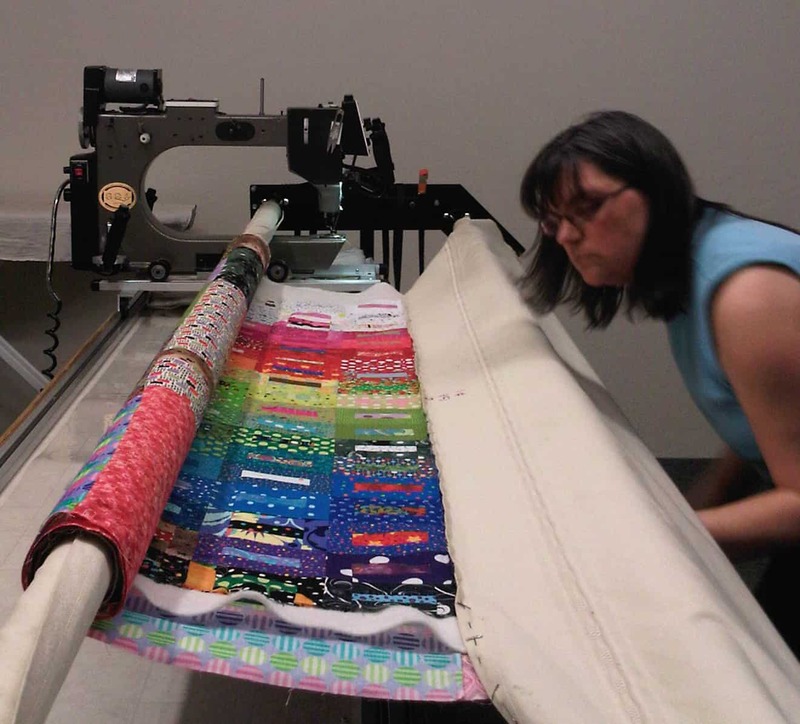 Keep in mind that your personal longarmer might have different requirements for how you prepare your quilts. 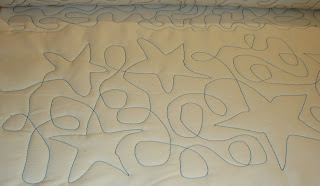 Make sure that you know what those are before you take your quilt to be quilted. Thank you for taking the time to quilt my quilt. I really appreciate your assistance, your artistry and your attention to detail. I want to support your small business, which is one reason I come to you. I want you to be successful and I want to be able to recommend you to my friends. I was a small business owner in the not-too-distant-past, so I know it is hard work and can be thankless at times. I have very high standards, which I will warn you about in advance. I have even higher standards for charity quilts. I do my best work on these quilts, so the recipients know I care. I expect the same from you. If you feel anxious about meeting those standards, please send me away with my quilt. I want my quilt done well and I don’t want to increase your anxiety level. I will respect you for being honest. Please remember that this is a collaborative effort and what I say to you in our initial meeting is pertinent to how I want my quilt quilted. I have worked hard on the piecing and want your quilting to fit well with my piecing design. 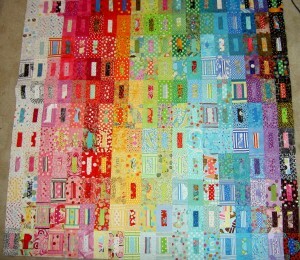 Please do not overshadow my piecing with inappropriate quilting. Please do not try to sell me on your designs. Listen to what I want and tell me if you can’t, or don’t want, to do what I want. My quilt is not your playground to show off the quilting that would be much better suited for a whole cloth quilt. I will tell you that my backs are always pieced and I don’t always press the seams open, that my quilts are almost never square (though not terribly off), and that I use fusible and raw edge applique’. If you can’t, or don’t want to, deal with any of these peculiarities, please tell me upfront. I’d rather know and find someone else. I will respect you for being honest. Please act professionally. 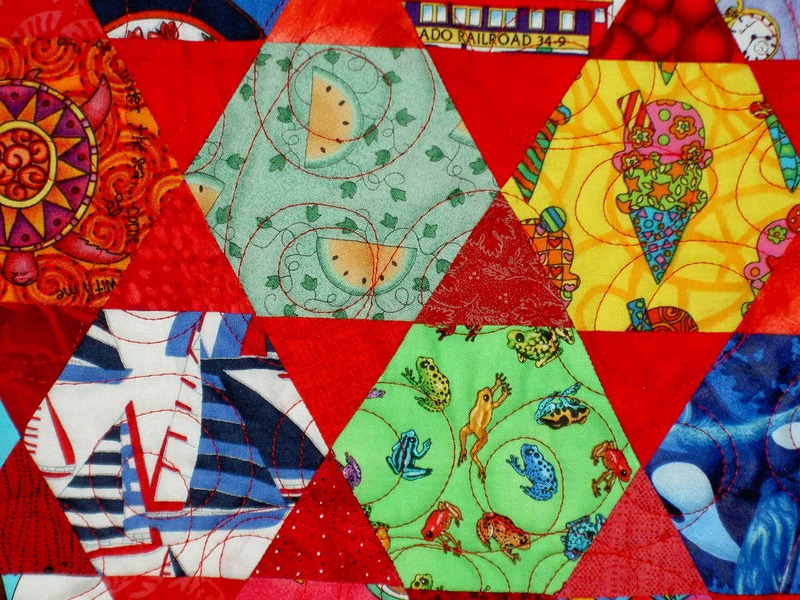 Do not whine, after the fact, about my unsquare quilts, pieced backs or fusible applique’. If you whine afterwards, I will suspect you are blaming me for your own poor longarming skills and I am not interested in excuses. If you have, or think you might have, a problem with my quilt, please don’t take it on in the first place. I will respect you for being honest. Please be generous about your competitors. Making snide comments about them does not endear me to you or make me loyal. Please make sure your machine is in good working order. Please make sure you know how to load the back tightly so there are no pleats. Please clean the oil up so it doesn’t stain my quilt. If you do get a pleat or have a problem, I expect you to rip out the quilting and do it over AND not charge me for the time. Your mistake = your problem. Please have the quilt done when you say it will be done. If it isn’t done, please call me and we can work out a new time to get the quilt. If I arrive and the quilt is not done and you are not working on it, I won’t be happy. Please be realistic about your commitments. Can you really finish my 5 quilts this week? REALLY? Finally, if someone else picks up my quilts for me, don’t tell them that you screwed up and are glad they picked up the quilts instead of me since you knew I would be angry. If you think I will be mad, fix the problem. I have a phone and can call you. I can be angry over the phone. 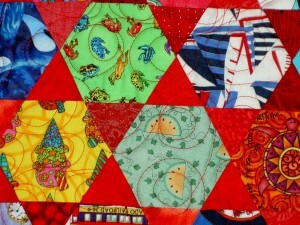 I spent time yesterday machine quilting the Fabric of the Year 2008 quilt at Always Quilting. It took me 3.25 hours from the time I started pinning the piece to the machine until I took it off. 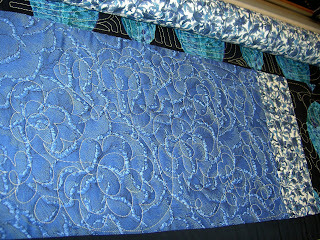 It was the fastest I have ever done longarming-all three times I have quilted a quilt on the longarm! I can’t really take all the credit credit for the speed, however. I did focus on the longarming, but the helper did everything for me except the actual quilting. 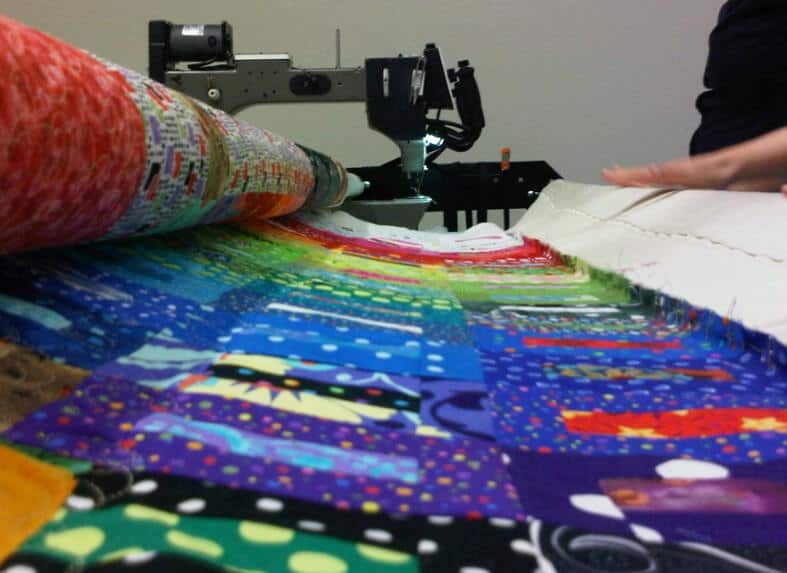 The quilting part is actually the speediest part of the longarm process. The other parts of the process are pretty time consuming. 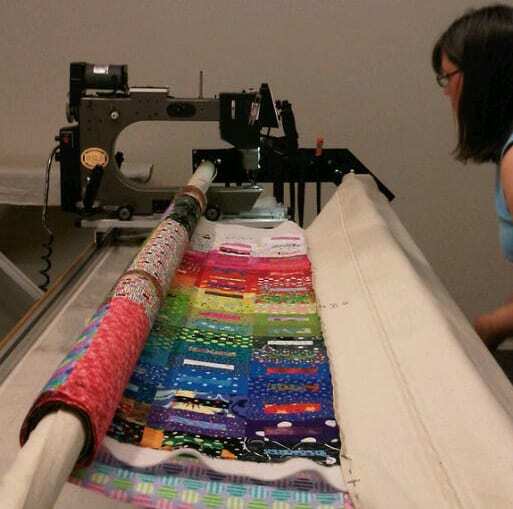 You have to, first, pin the quilt to the leaders on the machine afer you center it. When the bobbin runs out of the thread, you have to wind and change the bobbin and start up again, etc. While these tasks sound really straightforward, they add to the time it takes to move the process along. Since I am not an expert, all of these tasks take me longer. I need to learn how to complete the whole process alone. In order to get the process straight in my head, I need time. 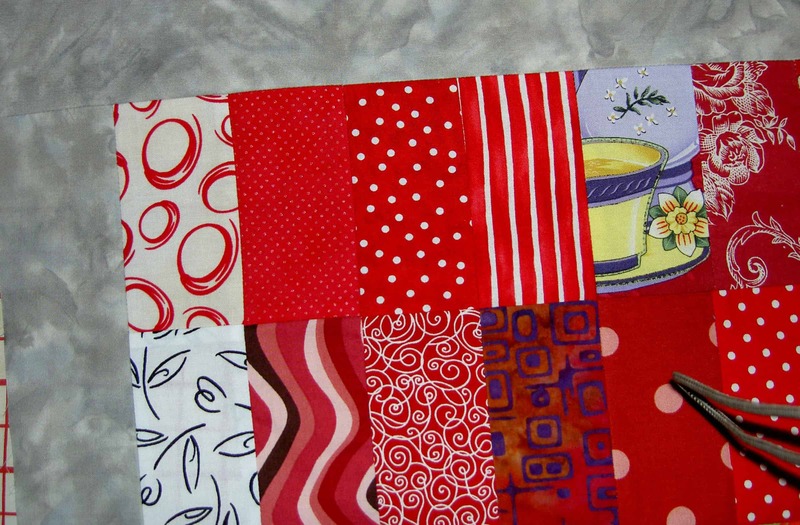 I need time to think and make logical connections between the tasks while I am quilting. Today was not the day to do this. They wanted me to quilt my quilt and get off the machine. They had a Kid’s Camp going and needed to have one of the girls finish her quilt after I was done and by the end of the day. As a result, anything except for the pinning and the quilting was done by my helper. I didn’t ask her to do this. She just, basically, muscled me out of the way and did it. It was fine. I have had a long week or so and was tired. 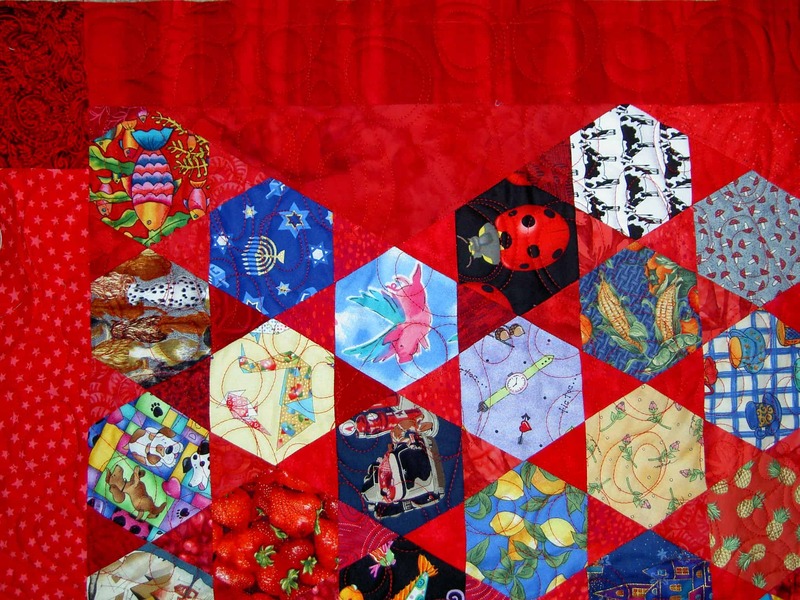 I am particularly fond of the quilting in the red next to the red circles with white background. I stopped in this spot for some reason and snapped a picture so you could see an image of quilting and non-quilted spaces. See how tight the quilt is? You could bounce a quarter off of the top. I make my labels by printing on fabric something that I type into a word processing program, like Word. This is how the back looks after pinning it to the leader. I was looking down from the top. Here is how the back looks from the other side when it is pinned to the leader. I am trying to collect pictures of the entire process in an effort to make a visual tutorial for myself, but it is taking me awhile. After you finish a row, you have to cut the threads and move back the controller to the left side of the machine to start the next row. 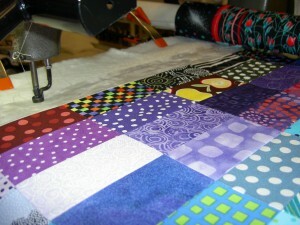 Before you can start quilting, the quilt needs to be rolled up to an unquilted section. I don’t like borders that much, especially if the quiltmaker has just slapped them on to make the quilt bigger. 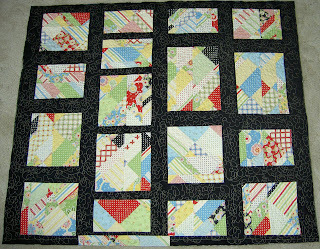 However, I decided to add these borders so I would have something other than the piecing, which I like, to trim in order to square up the quilt. I wrote about this issue in a post from 2005 when I was binding Feelin’ Blue. I added a grey that had been hanging around the fabric closet for awhile. The ladies at the quilt shop were a bit horrified that I was going to cut this off. They liked the grey. It was something I tried and it worked ok. There was still one corner that got a little distorted. We’ll see how it looks after I put the binding on. Last weekend, after longarming all day on Friday, I spent time on bindings. I made and machine sewed the bindings for Eye Spy and the Crazy Test. Last night I worked a bit on doing the hand sewing on the Eye Spy. 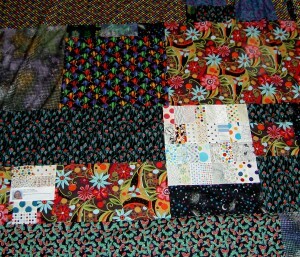 Neither of these quilts will have sleeves, so once the hand sewing is done, they will be done. The pattern I used to quilt this quilt with is called Double Bubble. 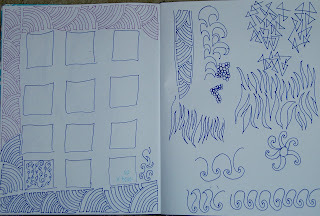 I wanted to use the same pattern as Thoughts on Dots, but I didn’t remember to look carefully at it before I left. 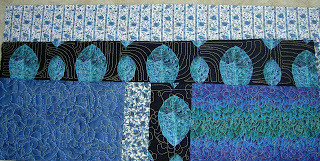 I am pleased with this pattern and may used it again for the FOTY 2008 quilt. Practice does make perfect as well. I thought I did pretty well the first time, but my stitches improved immensely this time. I didn’t add a practice piece to this quilt and it turned out that I didn’t really need it. I worked really hard at going the same speed regardless of what I was doing. I didn’t always succeed, but I improved. 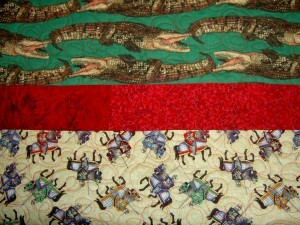 Here is the famous crocodile fabric quilted. I think using it worked out really well. My next longarm day is in April and then I have no more quilts to quilt, so I need to get on the stick if I want to keep up my momentum. We’ll see. One of the things I did to prepare for my longarm day was to doodle. I got out the sketchbook and did some doodling in it. 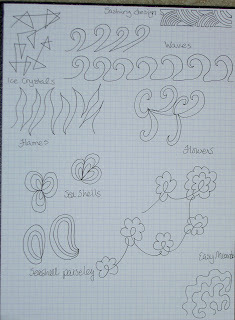 It wasn’t true doodling, because I used some reference materials, including some designs from a Melody Johnson class I attended in 1999 as well as some worksheets and the book from a Sue Nickels (nice little bio) class I took sometime later, perhaps around 2002 or 2003. This was all before Diane Gaudynski exploded on to the scene. The paisleys and little 3-petal flowers would be too difficult for me at this stage, but perhaps later. Still, the whole idea is to get your muscle memory into shape. 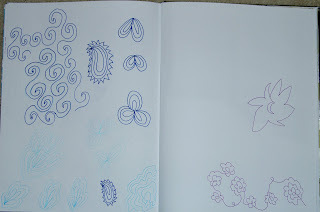 That flowing doodling kind of motion is what you want to achieve when longarming. You can see how into those sashing curved designs I was. I really wanted them to work. I may still use them in another quilt even if they aren’t perfect. 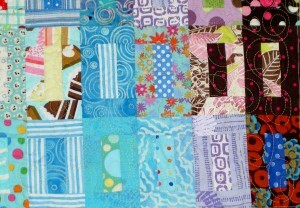 One of the things I did when I was in the machine quilting groove was make a worksheet of designs for my quilt class. It has some basic designs and ideas on it. I still need to make the other class information, but at least this part is done. I know I haven’t mentioned it in a while. Frankly, they all kind of bailed on the basting part and I don’t know if they will continue. It is a little disheartening, but I have an idea in my mind to teach a class like this elsewhere at some point (no plans at this time), so perhaps the work won’t all be wasted. So, yesterday was the big day. I went to Always Quilting and quilted a quilt on my own. The short version: it was good, it was hard and I needed help. During this foray into the world of longarm quilting I was able to complete the quilting for a quilt and a practice piece. I am thrilled to haven gotten this far on a quilt on my own! It has been awhile since I quilted anything larger than a journal sized quilt. One experience/feeling I wasn’t expecting was that I felt like I learned a ton! I always feel that it is a good day when I learn something new and this was an even better feeling, because I learned something related to quiltmaking. Neither of these pieces will win any prizes, but I really feel like the experience was successful. Above are the two finished pieces. They were sewn together to make it easier to get them on to the longarm machine. I cut them apart before I came home. I sewed the top patchwork piece to the quilt (bottom) in order to have a practice piece to work on before I got into the quilt itself. I always warm up when I machine quilt at home and I didn’t think this longarm adventure should be any different. For the practice piece, I pulled out some old blues and sewed them together. I do like that Nancy Crow leaf fabric, but was never very successful at using it in a quilt. 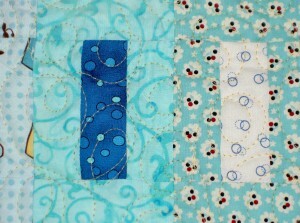 Two details of the Crazy Test quilt. The line of stitching you see at the bottom (upper photo) is basting and I will need to pull it out. I think the flower stitching on the bottom photo looks ok. It is an all over pattern, but I don’t think it competes with the sashing or the blocks. In the blocks, it is nearly invisible. When I have someone else quilt a quilt, I focus on the piecing. 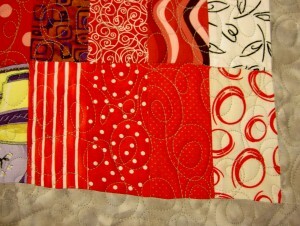 I want the quilting to blend in and not take away from the piecing. Thus, I was surprised to find that I wanted to see the stitching. It makes sense to be able to see the stitching as you actually stitch! 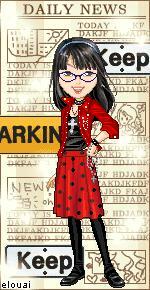 I found that when I was done with a section, I wanted to be able to see what I had done. Above, I don’t think the stitched flowers, as a design element, look that good on top of the leaves. The two design elements compete with each other. The stitching in the leaves is the stitching that I also did in the blue and white striped fabric at the top. It shows up a lot better on the black and was a lot easier to see as I stitched over the Nancy Crow fabric. I had planned to use that pattern (from a 1999 Melody Johnson class) in the sashing. I like the way it came out, but if you examine it closely, you will find that the lines are not parallel and the ‘legs’ are different sizes. I think I will have to practice more before I can use that one on a real quilt. Contrary to the flowers over the leaves that I mentioned above, I don’t mind the parallel lines over the leaves in the photo above. My general preference when viewing quilts is to see the quilting compliment the elements of the quilt. 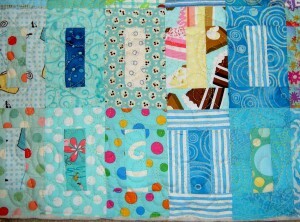 For example, I usually like to see different quilting in the sashing than I do in the blocks. What I found after yesterday’s session was that those differences in the quilting pattern require lots of practice. Longarming in general requires a lot of practice. If you think you can go and buy a longarm and start quilting for other people, more power to you. After doing some of the math, I fiure that I can quilt 10-12 quilts for less than $500. This means it would take me years to pay off even a Handiquilter, which runs about $8,000. I like the above photo, because it shows the quilt rolled up on the machine. You can also see the flowers pretty well. I want this to be a year of creativity. I can’t say that this is on my to do list, but it is in the back of my mind. One way to do that is to sew as much as possible. 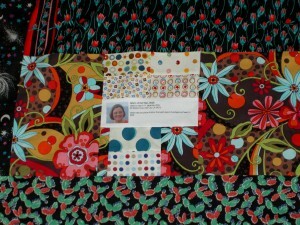 To that end, I took the longarm certification course at Always Quilting on January 9, 2009. As a result, I am now a certified longarmer at Always Quilting. Don’t be too impressed as this certification only gives me the privilege of renting their longarm to quilt my quilts. Still: YAY! After seeing the demo in November with the CQFA team, I signed up for the class. I was curious about the whole longarm process and because I wanted to see how I could incorporate the longarm as a tool into my repertoire. I really enjoyed the class. It was an expanded version of what we learned at the demo. It was great to hear some of the same information again as it helps to cement it into my mind. 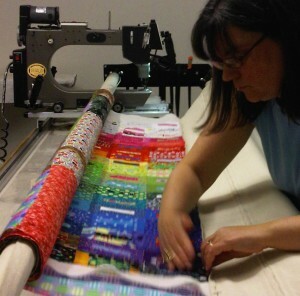 Some of the information she gave about preparing quilts, especially, applies to the computerized machine they use to quilt quilts for customers. It is a large computerized machine. One thing I learned was that the longarm professionals vary, but if you understand some of the background and the way the process works, you can work with your longarm professional of choice much more effectively. 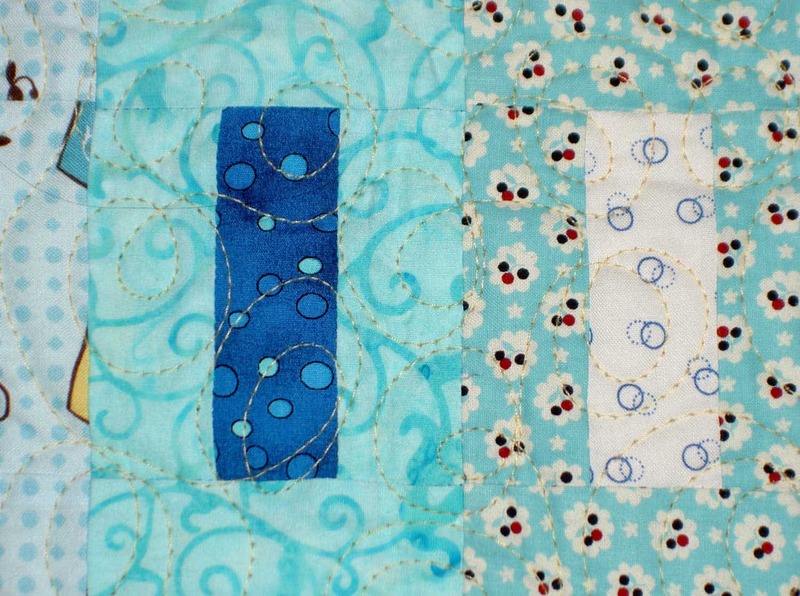 Always Quilting wants you to have square corners. 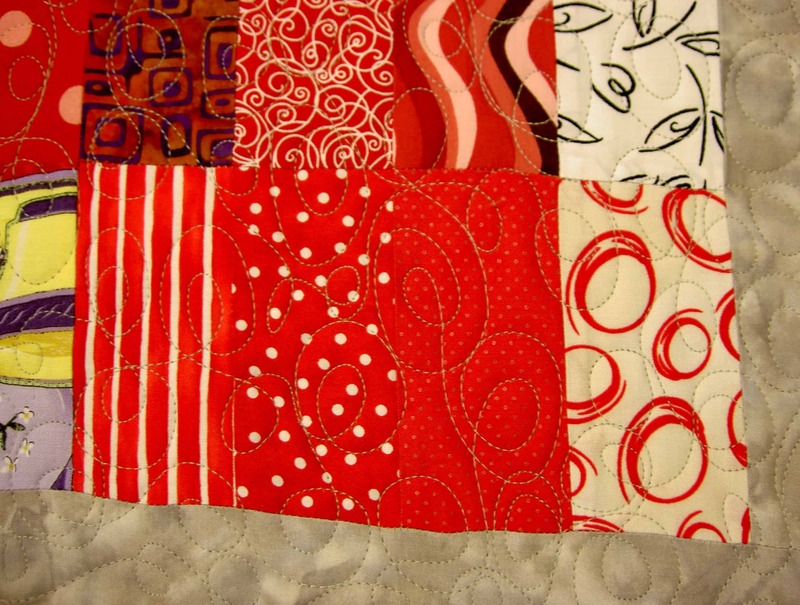 No lopped off edges or strangely shaped corners, because you use the corners to pin the quilt to the machine. Oh! Now I get it. Better fix that I Spy quilt. Kit also suggested practicing good pressing habits in order to reduce bulk where seams meet. The centers of pinwheels and 8 pointed stars can be a challenge for the machine. I was surprised to learn that the machines have a hard time going through selvedges! I’ll have to look at some of the quilts that Colleen has quilted for me to see what she does in this circumstance. 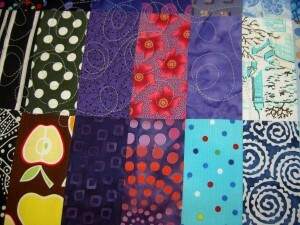 The Always Quilting staff wants the backs 6″ wider than the quilt and had several suggestions for the back. The back needs to be longer than the top, but they don’t care how long. It is ok to piece the back, but they don’t encourage it and the same rules about bulk and bulky seams apply. Kit suggested using large pieces of fabric rather than piecing a second top for the back. 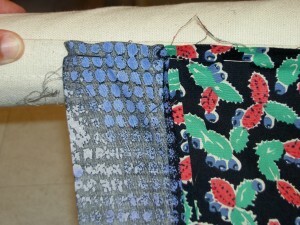 She also said to consider pressing seams open on the back and using a larger seam allowance to help reduce bulk. Both top and back should be square and FLAT. 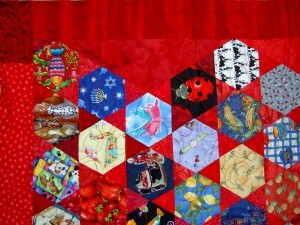 Kit reiterated that quilting does not cure all evils. 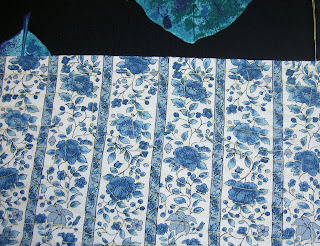 She gave some tips about measuring the top before one cuts and attaches borders that were really interesting, especially to make sure that there isn’t more fabric in your border than in the quilt top. Always Quilting prefers batting such as Hobbs Natural and Warm & Natural, both of which they carry. A quiltmaker can bring her own batting but they reserve the right to not allow you to use it. Apparently, batting with scrim works best. As you know, Colleen has quilted my quilts using Hobbs Organic for awhile with no problem, so I am not sure what I am going to do about that. Kit said that they want a quiltmaker to use the shop thread, because of the way it interacts with the machine. Again, you can bring your own, but they reserve the right to not let you use it. They use Signature, King Tut by Superior and Permacore, which is their preference. The Permacore is polyester wrapped in cotton. Bad thread can incapacitate the machine, which is why they encourage quiltmakers to use the shop thread. They have hundreds of colors. Put the back on first, right side DOWN. You could put a quilt on the machine sideways. 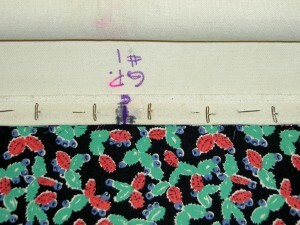 This orientation works well for row quilts because it is easier to quilt different things in rows. Find the center of the back by folding it in half. Pin the back to the leader about 1/4″ down from the edge of the leader. There are notes in Sharpie on what attaches to what leader. There is a black mark in the center. Pin from the center out. Brush the lint out of the bobbin area. There is a very important disk in the bobbin. Hold on to it when changing or cleaning the bobbin. Line up batting on backing right below the pins on the leader. Use a single stitch to baste the batting to the backing. Baste top to batting, lining it up just under the batting. I have found it important to doodle a bit before going to class. It seems to train your brain to sew a continuous line. It helps with practicing for achieving a smooth, continuous line. I assume this would be rule for going to quilt as well. 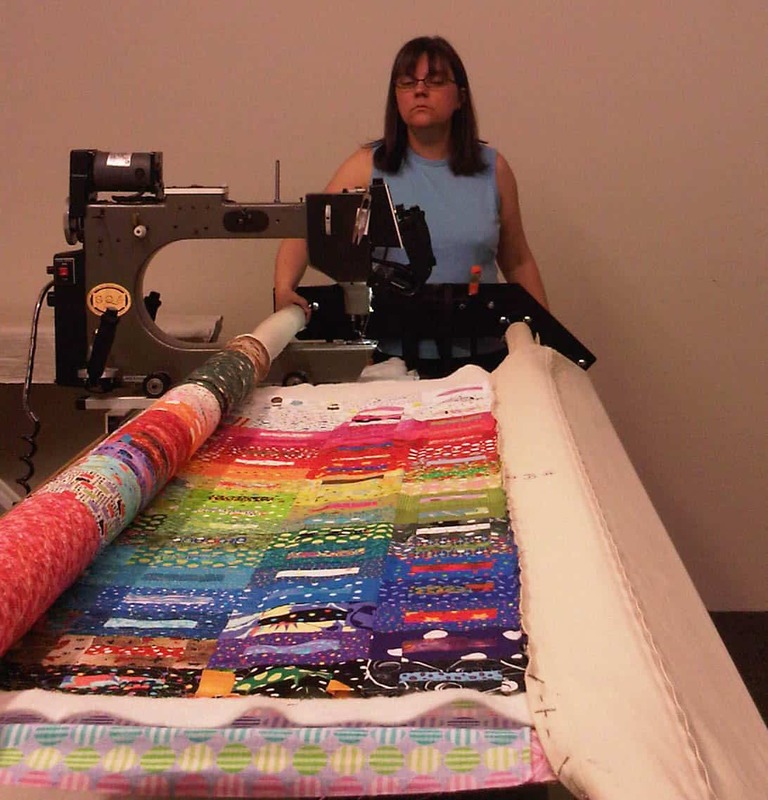 It gears up your muscles for the quilting motion. Above are doodles I made during class. They are my own variations inspired by designs from the various books the shop had. I wasn’t able to try them all out on the machine. One of the books we were able to look at was one by Trillium House Designs. They have a set of three books called Pocket Guides to Freehanding containing a multitude of quilting designs. Kit said Always Quilting didn’t carry them, because books 2&3 were too advanced and the company did not sell book 1 separately. The price for the set is also $55, which is a bit steep. 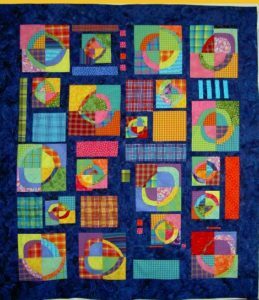 I think that there are a lot of continuous quilting designs out there you can use as a guide for your own quilting. It would pay off to start collecting some of those designs and practicing them with pencil and paper before renting the longarm. 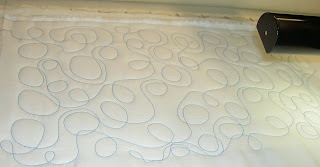 My section of free motion quilting loops. This is the pattern they encourage their students to use for most quilting project. They also encourage people to use this size of pattern when quilting. My attempts at using the pantograph (above). It was very hard to get the shapes smooth and I thought I would have an easier time posting the design on the wall and following it with my eyes, rather than trying to trace it using the laser. 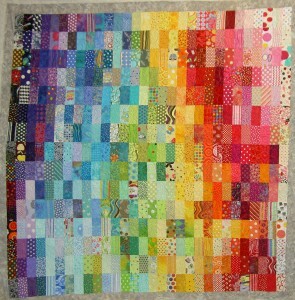 I am scheduled to quilt one of my own quilts on February 6. I am planning to quilt the Crazy Test. I was planning to quilt the hexagon/I Spy quilt, but decided to do something I didn’t care about much before quilting something I did care about. I do have to make the back before I can quilt it. The longarm doesn’t work very well without a back! I was really pleased with this class. I thought it was well run and thorough. 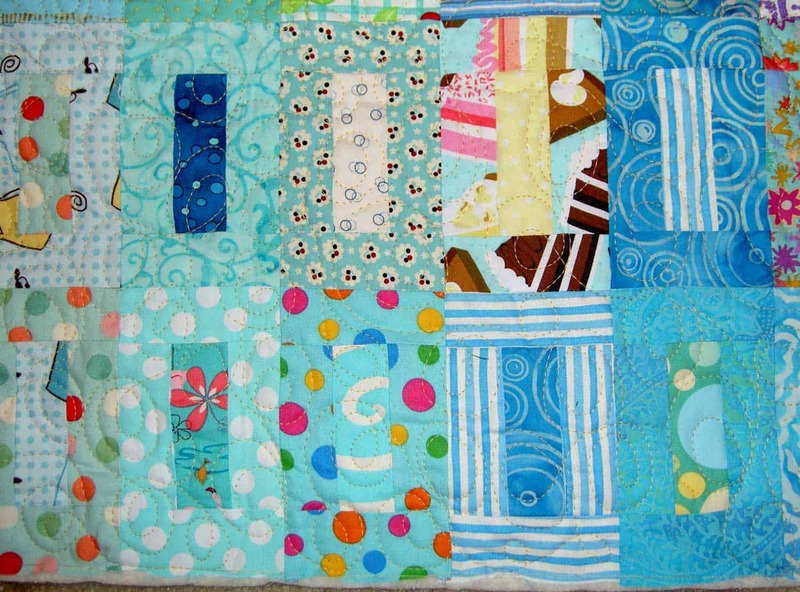 I saw this quilt in the Denyse Schmidt ‘Pool’ (DSP) on Flickr. 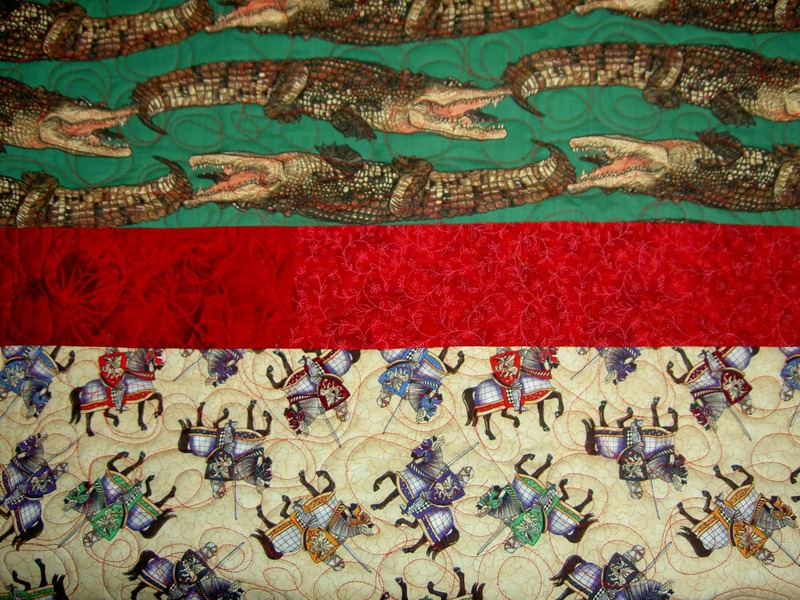 The DSP is a group of photos of projects made from DS patterns or fabrics. 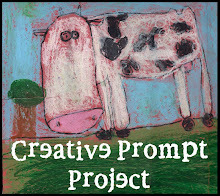 It is interesting to look through and see the different projects people have made. I saw a couple of things, as I mentioned earlier in the week, that were inspiring. TFQ asked for more information about the longarm demo I attended last week. As a result, I have been writing about in a letter to her, thus it is on my mind. 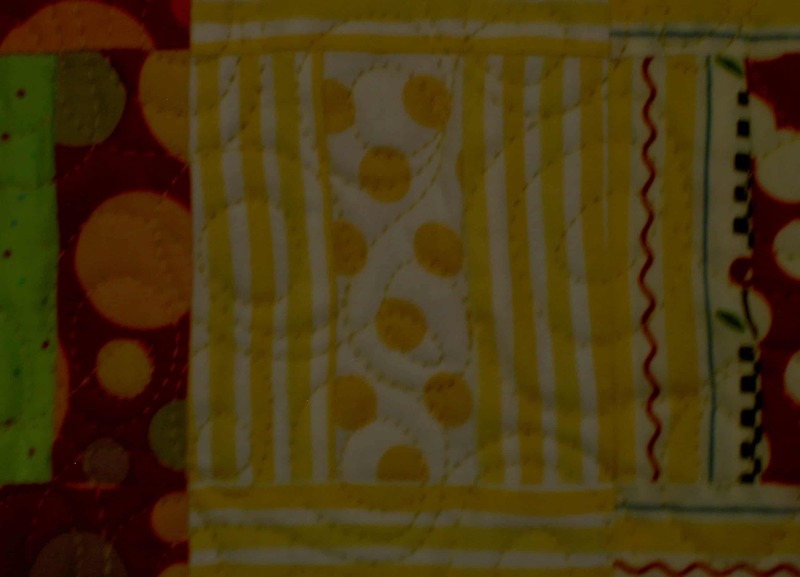 As I was going through the photos on the pool, I saw this quilt and thought that the quilting design was interesting enough to note. 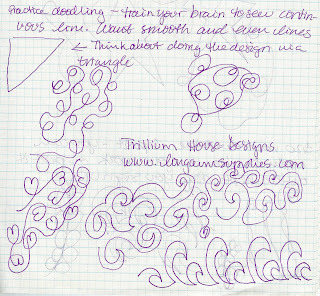 One thing that Kit, from Always Quilting, said was that one needed to doodle designs to be prepared to draw them with the longarm. Mom confirmed this when she went to try out her friend’s longarm. She said she thought it was about muscle memory. This picture serves two purposes: the one above, obviously, but also to move me along in a task for my quilt class. I have been putting off creating the machine quilting design sheet for my beginning quilt class because they have totally lost interest and have not basted their quilts. I would like to teach more people to quilt, so it is worthwhile for me to create the worksheet for the future. Seeing this great design gives me a little incentive. 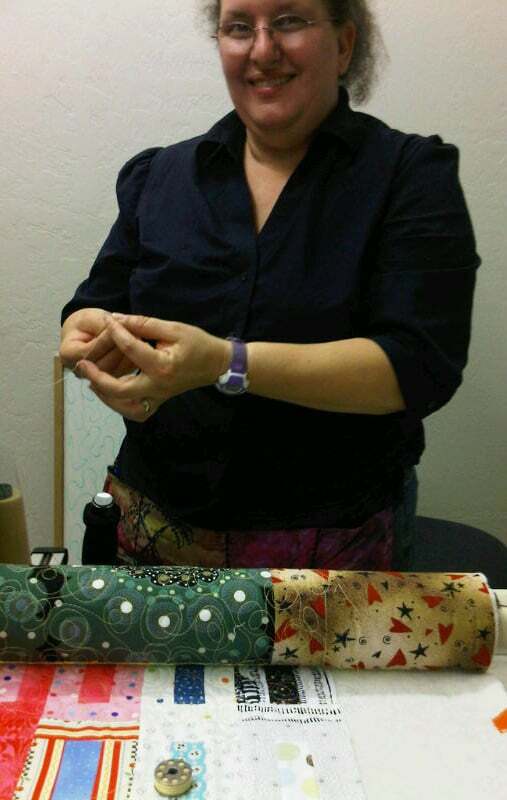 I went to the CQFA Meeting yesterday, which was held at Always Quilting in San Mateo. One of the reasons we went there was to get a demo of their longarm quilting machine and find out about learning to use it. I took the above video at the demo. I tried out the machine as well and found it very easy to drive. Kit, one of the shop owners, had already loaded the machine with fabric for us to work on. She gave us a lecture on preparing the quilt for the machine and how their program of learning to load and use the machine worked. 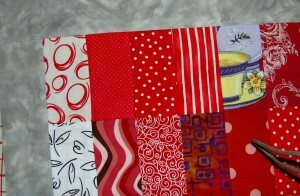 I thought she was a good lecturer and gave many good hints for preparing a quilt to be longarm quilted. 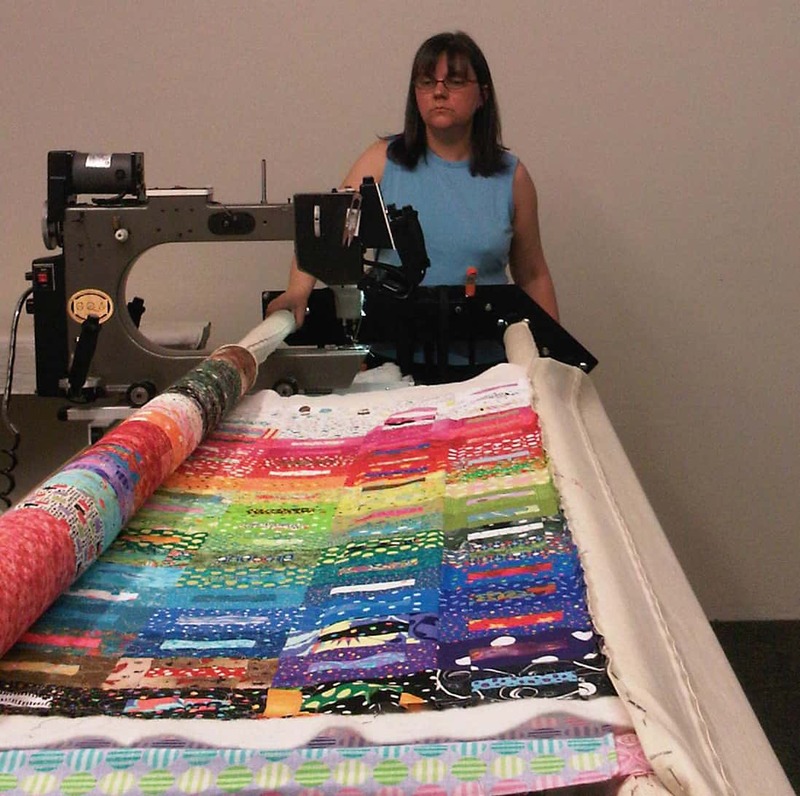 I have worked with a longarm quilter for awhile and know how she wants things prepared. I was surprised to hear that Always Quilting likes things a little differently done. After the demo, we went to the back room, had lunch, worked on projects (see later post for pics of my work) and had our regular meeting. I ended up signing up to take their their longarm quilting training in January. Their policy is to take the training and then you are allowed to rent the machine. I don’t expect that I will quilt all of my quilts myself, but I think it will be good to quilt some of them myself, and perhaps, less expensive. In any case, education is always a good thing.